When the sky is clear and you look to the south, Washington’s highest mountain dominates the sky covered in snow and 26 major glaciers. Mt. 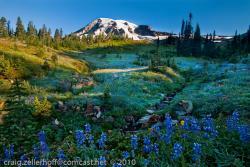 Rainier is the highest mountain in the Cascade Range and tops out at 14,411 feet. Paradise is famous for its majestic views and wildflower meadows and is home to the park’s Paradise Jackson Visitor Center. 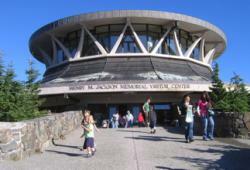 Start your trip at the Paradise Jackson Visitor Center to learn more about the park and see the new park film. For lunch, stop at the historic Paradise Inn, which was built in 1916 and see the authentic Native American arts and crafts at the gift shop. After lunch, drive three miles east of Paradise on Steven Canyon road – you may be able to see Mt. Rainier in the subalpine Reflection Lakes. Park your car and take the 2.6 mile hike along Pinnacle Peak trail for views of Mt. Rainier and nearby Mt. Adams. After the snow melts in early summer, go higher up on the mountain to Sunrise, which is the highest point that can be reached by vehicle. On clear days, you can see Emmons glacier and many of the other volcanoes in the Cascade Range. Start your visit by seeing what the glaciers created many years ago at Tipsso Lake. If you are looking to hike, try the Sourdough Ridge Trail, which offers numerous wildflower meadows and breathtaking views of Mt. Rainier, Mt. Baker and Mt. Adams and Glacier Peak. Pack a picnic and stop for lunch at the Sunrise Visitor Center where you can also learn more about the park’s history. Drive to Sunrise Point, and on the way, watch for the andesite columns on the left that were formed from an ancient Mt. Rainier lava flow. Finish your day taking in the sweeping views of the Cascade Range, Sunrise Lake and Mt. Rainier at Sunrise Point. After a full day in the mountains, you can return to the city with fresh air in your lungs and a life-time supply of beautiful images in your camera, and your memory.